Getting the right filter for your above ground or in-ground pool is essential if you want to swim in clean water and avoid gross water all season long. Choosing the best pool filter means you need to know what your options are and what all of the pool filter terms mean for you. I’ve written this guide to help you understand the different types of pool filters and how to find what you need for your specific pool. If you don’t get the information you need from here, just leave me a comment at the bottom of the page and I will help you figure out what your best choices are! Which Type of Pool Filter System Do You Need? 1 Which Type of Pool Filter System Do You Need? 1.4 Top Mounted or Side Mounted Valve? 1.5 Which is Really the Best Pool Filter Type? A lot of people with in-ground pools use sand filters because they are cheap and the maintenance is easy. With a pool filter sand, all of the particles coming through your pump go through a large bed of sand that filters them out to as small as 20 microns. Larger debris won’t get through, but small particles pass through sand filters fairly easily. Cleaning a sand filter involves backwashing the sand to push all of the debris and dirt out of it and out of the pool area. Sand gets replaced every 7 years or so, depending on the area you’re located in. Today’s pool experts usually talk about cartridge filters as a great choice because they offer a lower maintenance option that filters down to 5-10 microns. Cartridge filters use a thin cloth-like material to filter out particles and debris from your pool water. The filter area is actually larger than in sand filters, making it more efficient so it will use less water pressure to run. Cleaning the filters is easy, as you simply need to remove the cartridge and hose it down to wash off the filtered out materials. This final type of filter is a newer method that mixes the cartridge style with a natural filtering material called Diatomaceous Earth (DE). DE is a natural, organic material that is ground into a fine powder and used as a filter to remove as small as size 3 microns from your pool water. To maintain the filter, you simply have to backwash the system and replenish the DE materials. About twice a year you need to take the filter out and hose it off. Top Mounted or Side Mounted Valve? If you’re looking into a sand filter system, you can choose between getting a top-mounted or a side-mounted system. The systems run the same way, but the major difference is going to be the installation cost and the ease of maintenance. Top-mounted systems are the cheapest type of installation for sand filters. The piping is easier to install, making it lighter on parts and labor. However, it’s impossible to reach the sand inside without removing the top pipes, so it makes maintenance difficult. Side-mounted systems are more expensive, but they are easier to maintain. Which is Really the Best Pool Filter Type? Depending on what you need for your pool, any type of filter system can be the best. Most professionals will recommend cartridge filters to pool owners, as they are great filters for small particles and large debris, and they don’t require backwashing of your system like the sand filters do. 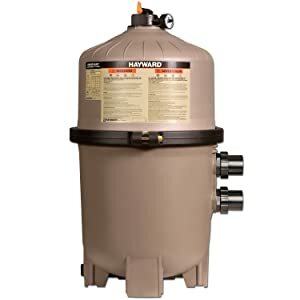 However, if you simply want a cheap system and you’re not concerned with filtering out the smallest particles, a sand filter is probably a fine option for you. If you want the clearest water of all, a DE system is your best choice. Additionally, you have to consider what the right pool filter is for above ground pools versus in-ground pools because it makes a big difference what kind of system you get for your pool then. 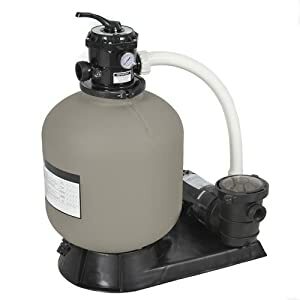 So you can find the right pool filter, I’ve gotten the details of a few of the best pool filter models on the market right now. These are filters that I consider to be a good value for the money and potentially a great choice for your pool. I’ve separated the categories into above ground pools and in-ground pools so you can quickly find the relevant filters to meet your needs. 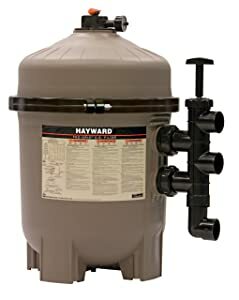 This Hayward sand filter is available in 5 different sizes: 22, 24, 27, 30, and 36 inches. It’s a top-mounted sand filter that’s easy to set up and start running immediately. The design is based on getting the best flow speed possible at all levels of pressure, making it an efficient way to clean up your pool. 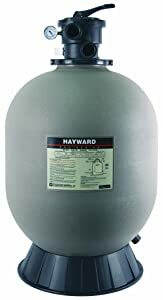 Hayward made this filter to be hassle-free and simple to maintain. All of the sand inside the filter is used because of a better spread of water. It provides excellent filtration and clear water for the average pool owner. This is an energy-efficient design that’s meant to save you money by running properly and utilizing all of the sand and water flow techniques it can. Backwashing is simple and can be completed easily in just a few minutes. A high-performance product for in-ground pools, the Pentair Sand Dollar handles up to 28,8000 gallons of water effortlessly. A rugged construction, highly efficient design and hydraulically matched components ensure clean, crystal clear water. The special filter design keeps the sand bed level, which is critical for ensuring consistent performance. The Pentair is created from a single piece of reinforced fiberglass that is US resistant. The product has a flow rate of 98 GPM, a turn overcapacity in gallons of 8 hours (47,040), 10 hours (58,800), and 12 hours (70,560)The internal design keeps the sand bed level, thus ensuring an even water flow with the water receiving maximum filtration. This is one of Hayward’s latest offerings in pool filter technology. 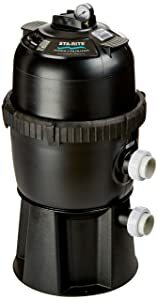 The filter is molded of durable, corrosive-proof thermoplastic and features an advanced, self-cleaning lateral drain systems that allow for a smooth, efficient flow and balanced backwash. This sand pool filter is only meant for small above ground pools. It comes in 4 different sizes according to the size you need for your pool: 1050, 1600, 2150, and 3000 GPH (gallons per hour). Intex lists their pump by the gallons per hour speed of the pump to help you choose the right model to easily work on your pool water. Maintenance on this filter system is very easy, with a backwash option in the control settings. You won’t have to replace the sand except once every 5 years. No matter which size you get, this filter system works well with Intex pools of various sizes. It is also easily compatible with Intex pump systems and other Intex brand pool attachment. 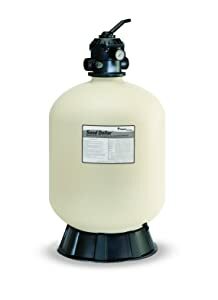 For small to medium above ground pools, this sand filter is easy to connect and effective for up to 18,000 gallons of water. It is only good for above ground pools and isn’t meant for in-ground pools; even if they are spas or smaller pools. 6 different speed settings can be activated to make the filter work for you. It works with as low of pressure as possible to be more efficient and use less electricity. This is also a top-mounted system that requires you to remove pipes and plumbing to reach the sand storage area of the filter system. You can expect years of great service from this filter, as it’s made of strong materials that are weather-proof and heat resistant. The high capacity sand bed is larger than many of the other in-ground pool filters. Because of this, it can extend the lifecycle of the sand and keep you from having to backwash the filter every day. You will also catch more debris at a time, which is great for pools that get very dirty from the environment. 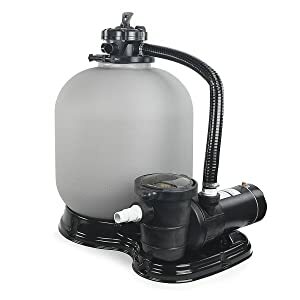 Instead of buying the filter system and pump separately, you can get a model like this that includes both a sand filter and a small pump for your above ground pool. It’s recommended for pools up to 18,000 gallons. The core body and tank of this unit are well built to withstand the elements and operate fine around your above ground pool. This sand filter is not suitable for any spas or for some therapy pools, as the maximum water temperature it can handle is 105F. However, it’s a great choice for a regular swimming pool for exercise or enjoyment, as its filter capacity and 1HP pump system works well with most pools. 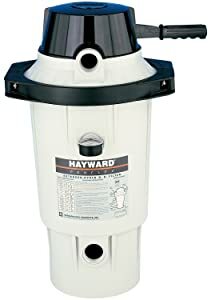 Hayward has released this cartridge filter in 5 sizes: 225, 325, 425, 525, and 725 square-feet. It’s a strong and heavy-duty filter that will resist heat, cold, and the elements to keep working well for you whenever you need it. Its outer shell is made from Noryl, a sturdy co-polymer reinforced with glass. The filter debris area is large enough to keep you from having to service your filter system as often, because it can hold a fairly high volume of dirt and debris before it needs to be emptied. Once it comes time to wash off the filters, opening the system and removing the filter for hosing is very easy. You can do any regular maintenance on this filter system without having to disconnect or mess with any pipes at all. The self-aligning top and bottom halves also make maintenance and setup easier for you. 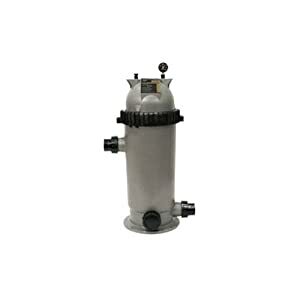 This Pentair residential cartridge pool filter system is made with 420 square-foot filter capacity. 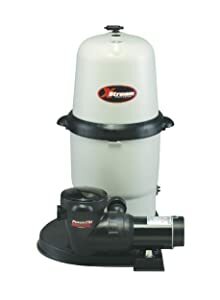 It’s great for collecting a large amount of dirt and smaller particles in between cleanings without impacting the overall performance of the filter. The larger pool cartridge capacity helps to reduce the frequency of cartridge cleanings necessary to maintain a clean pool. If you have an overhanging tree or any other source of a lot of debris, you may still need to empty it out more often. However, the average pool owner will probably only need to clean the cartridge once or twice a month at most. This is a great convenience for low-maintenance pool management. The reusable polyester pool filter cartridge in this product provides for heavy duty, extra-long filtration cycles for a maximum pool size of 43,200 gallons of water. The filter cartridge is easy to clean – just remove and rinse under a hose. The filter tank is extremely durable and constructed of Perma-Glass XL that is reinforced for ultimate strength. A compact and easy-to-use system, the Jandy Pro CS 250 provides great water filtration by means of a single element cartridge. Its compactness makes it ideal for smaller areas. It also features an ergonomic, easy-grip handle that allows for easy lid removal. 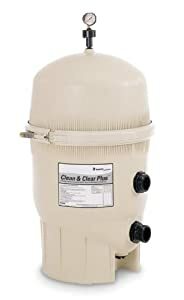 Easy to clean, this filter covers pools that are up to 250 square feet and has a maximum flow rate of 125 gpm. Additionally, a pressure gauge with a clean and dirty indicator is included, as well as a 2-inch drain port and high-impact thermoplastic tank body. 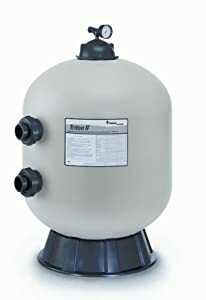 This cartridge filtering system from Hayward is great for a lot of larger above ground pools. It’s well designed to stand up to the different elements that are to effect an outdoor, above ground pool filter. The Xstream filter is reinforced with glass, so it’s non-corrosive and sturdy enough to last for a long time before you will have to replace it. The 1.5 HP motor is strong enough to keep the pump running well for its entire lifetime. 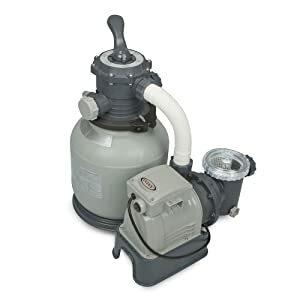 Hookups in and out of the filter allow for a large variety of pumps and other plumbing to be attached to it, making it easily compatible with other brands as well as devices from the same brand. According to the manufacturer, this pool filter work for above ground pools as large as 57,000 gallons because of its large filtering capacity. This larger size is a great feature if you want a faster water turnover time or if you own a large or extra-large above ground pool. 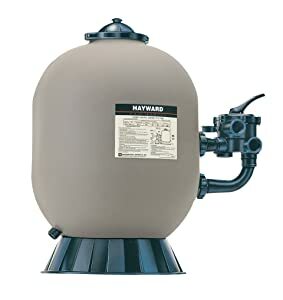 If you’re looking for a high quality DE filter for your pool, this Hayward model comes in 5 different sizes to suit your needs: 24, 36, 48, 60, and 72 square-foot models are offered. You can use this vertical grid filter for any time of in-ground pool or spa, especially because of the wide range of sizes available. It’s a durable and well-made system that accepts all types of DE pool filter powder. This particular DE filter system is good for either residential homes or commercial pools and spas as needed. It’s corrosion-free and made from Perma Glass XL materials that will resistant heat and water damage for years. Replenishing the DE supplies and cleaning the filter can all be easily accomplished without removing or disturbing any of the plumbing pipes. This makes it a good choice for a lot of home owners who don’t want to take apart the whole system just to clean off the cartridge. The FNS Plus is made of fiberglass-reinforced polypropylene, an advanced chemical resistant material that ensures both strength and durability. To top manifold has a service-ease grid pack that makes servicing very convenient. Optimal filtration and backwash efficiency is ensured by the unique internal design of the filter, while curved vertical grids provide you the maximum filter service to make cleaning a breeze. The Pentair Sta-Rite filtration system is suitable for both inground pools and hot tubs. It sports a single replaceable grid that supplies great quality water. This one-piece design is fully back washable. For deep cleaning, you can remove the filter lid and hose off without having to disassemble anything. 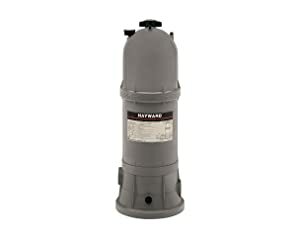 Unlike the previously mentioned Hayward DE pool filter, this filter can be used for both above round and in-ground pools of different sizes. There are 3 different models of this filter system available: the EC40AC, EC50AC, and the EC75A. Each model is a different size to be used in smaller or larger pools, according to your pool filter measurements. This filter works very well to remove tiny particles from your pool water and give you the most beautifully clear water possible. In addition to small particles and debris, this filter system also works to catch algae. It generally manages to catch particles on the first pass through the filter without allowing many to pass by and go back into the pool itself. The Perflex filter systems uses less resistance so that the use of your water and electricity is more efficient. It’s efficient and dependable with reliable cleaning power that will make your pool much cleaner than many other types of filter systems. This is a comparable system to other DE filters available from other brands. Pool filters have to be measured correctly to your pool size or else they will not work effectively. Ideally, the filter you choose should turn over the entire amount of water in your pool a minimum of twice per 24 hours. Commercial pools should turn over at least 4 times per 24 hours. Calculating your pool turnover rate requires you to know the size and volume of your pool. Once you have this information, you can choose a filter that will appropriately work for your specific pool. A properly maintained pool filter ensures clean pool water. It is thus of the utmost importance that your pool filter is cleaned regularly. The thing is a filter that works properly filters your pool water and collects any debris. After a while, however, this debris gets caught up in the filter and clogs it up. It also tends to increase your water pressure. This results in a reduced water flow, cloudy water, bad water circulation, and excessive wear and tear on your pool equipment. The frequency at which cleaning is needed depends on the pool size, filter, and situation of the pool. For example, a pool that gets leaves blown into it regularly may need more frequent cleaning of the filter. So while some people may need to clean their filters once a season, others may need to do so on a weekly basis. Open the air bleed valve(usually located on the top of the filter) and the drain port (at the bottom of the filter) in order to drain water. There are two types of DE filters. The first has a push/pull or multiport cleaning valve. The cleaning procedure for this type of filter is exactly the same as that of a sand filter with one difference- a lot of the DE is removed with the dirt so you need to add more. Do remember, however, that you should not rely on a pool pump as your only pool cleaner. Depending on your type of pool, you will need to add pool chemicals as well. In order to spare your pool filter, the use of a pool cover is recommended as it traps most of the debris that would normally enter your pool and land up in your pool filter. Hopefully, you now have a better idea about how to choose the best pool filter for your needs. Out of the three different types of filters, you have to choose the one which works the best for your specific pool setup and preferences.